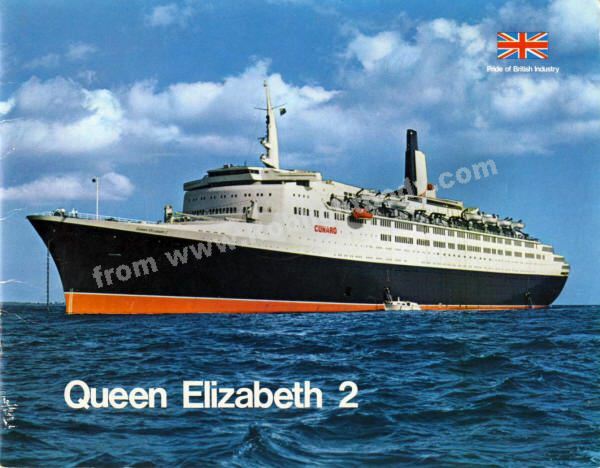 This booklet was produced in 1969 to mark the completion and entry into service of the QE2. This was one of a series marking major British creations to be proud of. Front Cover : Queen Elizabeth 2 cruising off the Canary Isles. THE oceans of the world have a new Queen. A British Queen—Queen Elizabeth 2. She was built on the Clyde in the same yard from which her illustrious predecessors were launched. She is as functional and as beautiful as the best of British design and workmanship can make her. She is the sum of our skills, the highest expression of our art. She is the greatest cruise ship at sea—the world's first floating resort. She is, to quote Sir Basil Smallpeice, Chairman of The Cunard Steam-Ship Company "the most superb example of the shipbuilders' craft the world has yet seen." She is so technically advanced that several times a day' she "talks" to communications satellites in Polar orbit. The outcome of those conversations—QE2 can pinpoint her position on the globe to within 100 feet within seconds. Behind the bridge, a machine draws isobars on to a weather map to help the ship choose its sunniest course. Her radar not only plots the positions of ships in the area, but also indicates their course and speed. On the bridge itself, the 65,000-ton ship can be turned by the pressure of a finger tip on a control column no bigger than a man's thumb. Her computer, the first of its kind in a passenger ship, performs technical, operational and commercial functions at sea. It controls the ship's machinery, logs data, predicts fresh water needs, controls food stocks and adds up bar bills. It is claimed that Queen Elizabeth 2 is the most carefully planned ship ever built. The great kitchen serving the ship's three restaurants has been so carefully laid out that the paths of waiters never cross. Planning has meant that, though smaller than the Queen Mary and Queen Elizabeth, QE2 offers superior accommodation and amenities to the same number of passengers. Each passenger in QE2 has half as much space again as in the Queen Elizabeth, the world's largest ship in terms of gross tonnage. QE 2's deck space—over 6,000 square yards—is the largest sheltered open area in any passenger ship. The use of lightweight metals, notably aluminium, has given her an extra deck—she has 13 in all—and yet her draught is such that she can use both the Suez and Panama canals, and enter harbours denied to other great cruise ships. One of the most revolutionary concepts of her design is that she is like an hotel turned top to bottom. The five decks of rooms—and they are called rooms, not cabins—are below; the four decks of public rooms are above, and all the main ones run the full width of the ship. They have enormous windows rather than ports, so that natural light floods the ship. Window seats look straight down on the sea. These nine decks, their shape and layout determined by the naval architects, were handed over to a group of distinguished British interior designers with international reputations. It is from their far-reaching ideas that QE2 gets much of her impact, her changes of mood and pace as the passenger passes from one design concept to the next. The highest public room in the ship has been given to the youngest children. It is an imaginative experiment which includes a crèche for the smallest, a cinema with a seemingly endless supply of cartoon films, and a shallow pool for simply splashing about. the work. 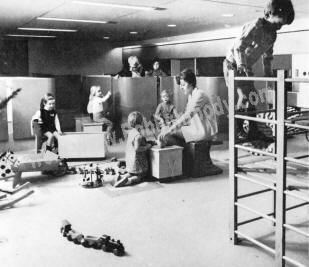 They produced a floor in bright yellow and orange hopscotch, doors covered in black-board, stools which double as building blocks, and small enclosures for solitary games which can still be overlooked by the ship's nannies. The Queen and Prince Philip with Captain Warwick on the bridge of 'Queen Elizabeth 2' on the eve of the ship's maiden voyage to New York. Sir Basil Smallpeice, Chairman of Cunard, is on the right. The Theatre seats 531 people. Designed by Gaby Schreiber, it is also used as a cinema, conference room and church. 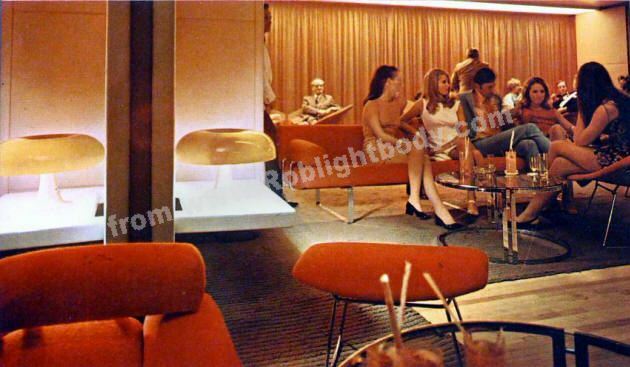 The 736 Club is the night club/discotheque for the younger, swinging set. Designers were Stefan Buzas and Alan Irvine. 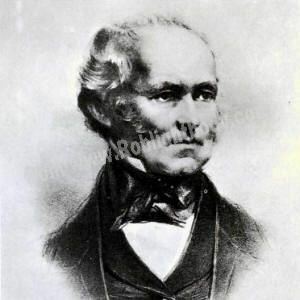 Samuel Cunard in 1840 founded the British and North American Royal Mail Steampacket Company and inaugurated a regular transatlantic service with the 'Britannia', sailing from Liverpool to Boston. She was tiny, even by the standards her day for she could carry only 115 passengers and 225 tons of cargo. The name of the line was later changed to The Cunard Steam-Ship Company. Within ten years Cunard was controlling eight ships and in 1852 launched his 'Andes', the first Cunarder to be built of iron and with screw propulsion. She was one of the most impressive vessels of the period and her saloon was described as 'a stupendous apartment'. More than 125 years later, the same description has been applied to QE2's Double Room (3 pictures below), the largest public room afloat. The area is vast, covering 20,000 square feet and seating 800. Designed by Jon Bannenberg it extends through two decks, forming the Double Up and the Double Down rooms, joined by a sweeping spiral staircase. QE2 at full speed on trials in the Firth of Clyde. 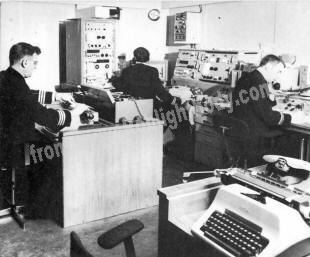 Picture alongside shows the chart room, navigational centre of the ship. From the sound control room music and news broadcasts are relayed to every cabin and are available at the touch of a switch. The radio room is capable of twice the output of the old 'Queens'. 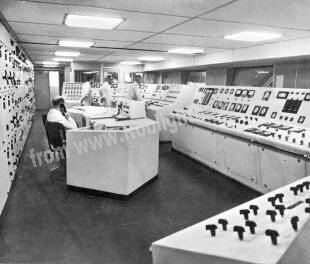 The main control room gives push button control of all the major machinery. The white and silver Queen's Room designed by Michael Inchbald, changes from elegant serenity by day to subtle sophistication at night. QE2 offers an immense variety of rooms from de luxe suites to single rooms each with its own lavatory, bath and/or shower. This is standard. 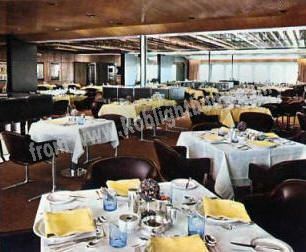 the largest restaurant on the ship, the gay Britannia Restaurant was designed by Dennis Lennon and seats 815. 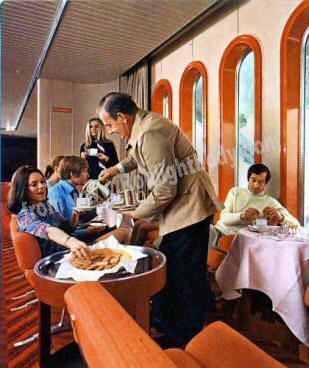 The de luxe Columbia restaurant was also designed by Lennon and extends the full width of the ship, seating 500.
catering for the person who wants a light meal at any hour of the day and halfway through the night. 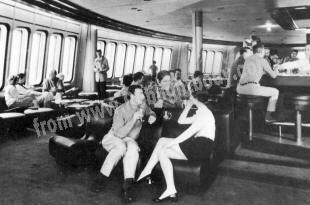 On QE2's first cruise it became one of the favourite places of the master, Captain William Warwick, who could often be seen lunching alone there on a hamburger. 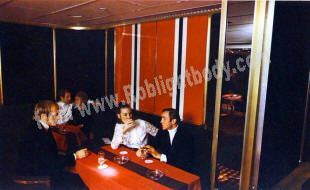 It is a bright and carefree room with white walls striped in jazzy colours and red vinyl-covered banquettes grouped in booths. The waitresses who are pretty and mini-skirted tread softly on the black carpet. 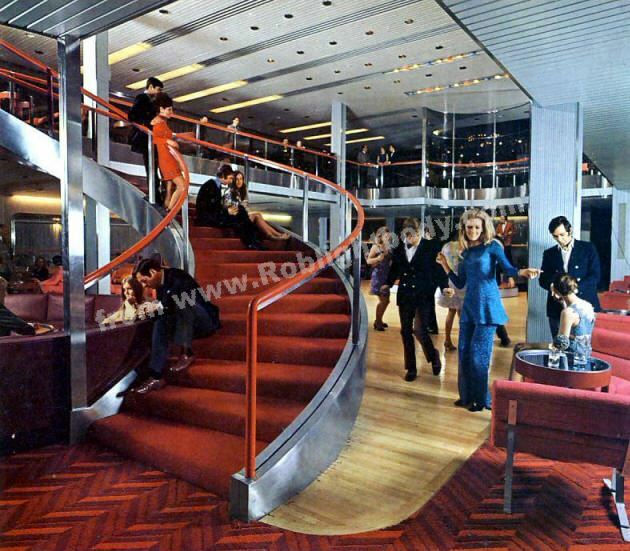 Forward of the Coffee Shop is the 736 Club, one of the ship's most popular nightspots with the young set. It takes its name from the shipyard number of QE2 and has a ceiling of gold leaf and a rich blue-green carpet which turns midnight blue when the room is lit at night. 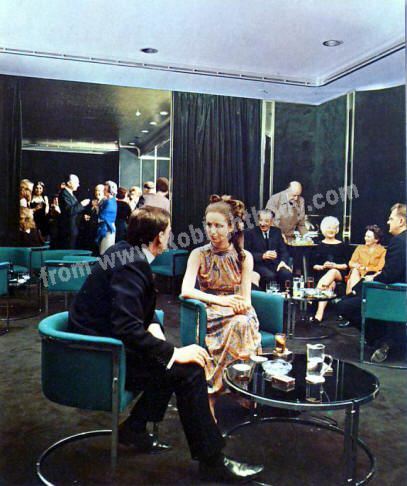 Although many of the public rooms, with their curtains drawn, have the discreet opulence of a luxury hotel ashore, the 736 Club retains a nautical air with tan leather upholstery on its banquettes, Indian laurel veneer on the bulkheads, and ship's lens lamps on the columns around the dance floor. 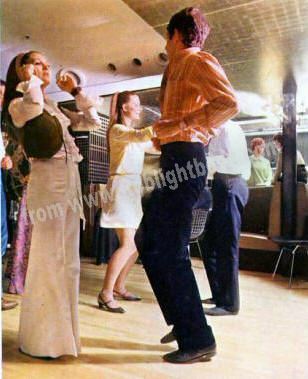 The room is wired to take any one of the pop groups which switch their venues about the ship, and is also fitted as a discotheque. It is popular with young, off-duty ship's officers. On the port side of the Boat Deck, opposite the Juke Box and in stark contrast with it, is the quiet arcade of the London Gallery—an experiment in selling works of art at sea. John Piper, Ben Nicholson, Francis Bacon and Graham Sutherland were among the artists whose work was Shown on early cruises, though changes can be rung, even during a single cruise. Small sculpture prices range from £100 to k2,000. Prints and original paintings are expected to sell from as little as £35 to as much as £20,000. 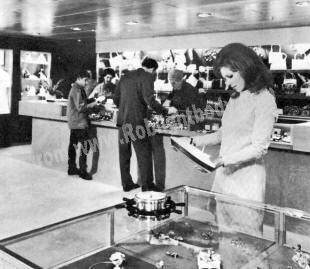 Further aft, down both sides of the Boat Deck run arcades of shops selling everything from everyday toilet articles to Mary Quant make-up, from beachwear to fine Wedgewood. Beyond the shops lies the upper level of the Double Room, the biggest public room afloat, and one of the most important entertainment areas in the ship. Its dramatic impact lies in its size—it seats 800 on its two levels—and in the fact that it is furnished entirely in shades of red, from plum to scarlet. Seats of scarlet tweed, plum leather and puce suede provide a constant interplay of shades and textures. The colours are picked up by walls of soft, silver anodised aluminium which cast back a flattering glow on the linen textured Formica specially developed for QE2. 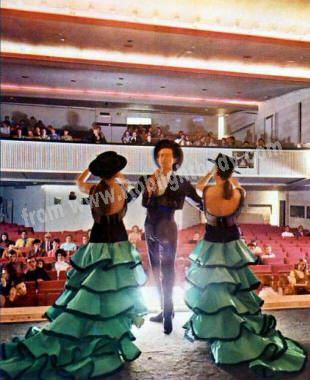 The designer, Jon Bannenberg, linked the two levels with a great stainless steel staircase, and gave the circular band-stand a pull-out apron stage for the nightly floorshows. The Boat Deck level has its own bar—the Double Up. So has the Upper Deck level—called the Double Down—which overlooks the open quarterdeck itself. 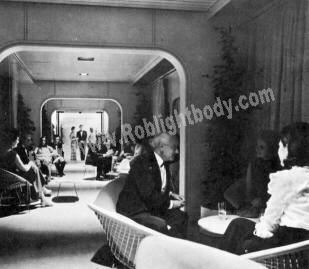 Forward of the Double Room, on the star-board side of the Upper Deck, is one of the more swinging areas of the ship, the Theatre Bar. 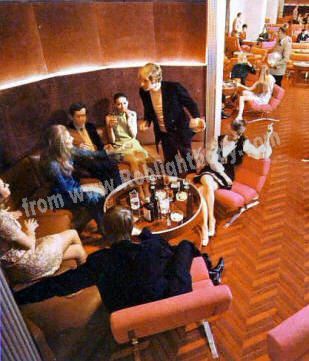 Taking much of its custom from late-night cinema crowds, this is one of the bars that stays wide awake when most of the ship is asleep. Its personality is probably best expressed by its grand piano, which is painted bright red. So is one wall, which is made of fibreglass and moulded in an egg-crate pattern. The dance floor in the Theatre Bar is always busy. It is difficult to believe that the same team, Dennis Lennon and Partners, designed the cathedral of calm on the other side of the deck, the Upper Deck Library. Insulated from the noisy gaiety of the Theatre Bar, the library is cool and still, a place of deep leather sofas, with slatted blinds to counter a tropical sun. The book shelves are lined with blue leather, and a paler blue tweed is used in some of the chairs. No footstep sounds in the thick-ribbed beige carpet, and there are gay, striped Conran fabrics at the windows. 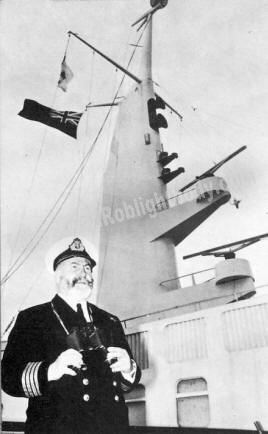 master of QE2, Capt 'Bil' Warwick who has been with Cunard since 1937. The Children's Room has every plaything for children. The designers were two College of Art students, Elizabeth Beloe and Tony Heaton. The beautiful yacht-like bow is captured in this superb night shot. Either side of the Queen's Room run the port and starboard anterooms, sunny sitting out areas . 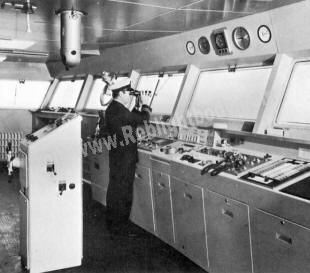 Officer on watch on the bridge which is equipped with every modern and automatic device. QUEEN ELIZABETH 2 is 963 ft. long, and her beam at the widest point is 105 ft. Her draught is a moderate 32 ft. 6 ins. enabling her to enter many harbours previously closed to ships of her size. She stands 171 ft. 4 ins. out of the water. Her gross tonnage is 65,863 tons, and she has 13 decks with a total deck space of 6,000 square yards. Three turbo-alternators produce 5.5 megowatts of electricity, sufficient to supply a town the size of Southampton with all its light, heat and power requirements. This vast electrical output is needed to run the tremendous array of electrical equipment including air conditioning which is installed throughout the ship, the 22 lifts, the escalator which runs between the kitchen and the Britannia restaurant, and the computer. This Ferranti 'Argus' computer is programmed to process all data logging, alarm scanning, machinery control, weather forecasting, and the control of all items of stock carried aboard the ship. It is also used to predict the amount of fresh water needed. This is distilled from sea water by three low-pressure evaporators which can produce up to 1,200 tons a day. There are 760 hotel staff members. They look after the 564 de luxe and 1441 standard class passengers on the North Atlantic run, or 1350 one-class passengers on a cruise, who occupy 291 de luxe and 687 standard class rooms and 30 public rooms. This highly trained staff ensure that all who sail in the world's finest and most modern ship enjoy the supremely high standards of cuisine, comfort and service for which Cunard have been famous for 130 years. The ship has two discotheques , this one serves the 736 Club. 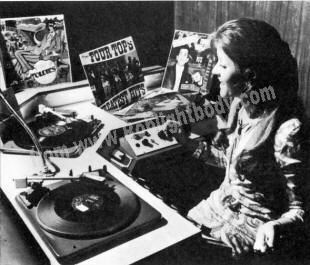 Tony Heaton and Elizabeth Beloe also designed The Jukes Box which incorporates pin tables, a juke box and other teenage playthings. Between these two rooms the Tour Office stays open well into the evening to arrange trips ashore in cruise ports. The Theatre, whose balcony is on the Boat Deck, seats over 500, and is used as a theatre, cinema, church and conference room. Each armchair seat has a fold-down tray for conference use, and a pocket to house a short-wave receiver when simultaneous translation is being used. Forward of the theatre is the Britannia Restaurant. With seating for 815 people it is the biggest restaurant in the ship. As the great room runs the whole width of the ship, and because it reaches high in the ship's superstructure, it affords magnificent views. Tall windows flood the room with sunlight, picking out the details of its red, white and blue colour scheme—white fibreglass bulkheads, blue tweed banquettes and carpet, red handrails and table napkins. Its area is so vast that it has been broken down into more intimate dining areas with duckboard screens which lend a maritime touch. The splendid Britannia figurehead which stands in the forward entrance was carved in pine by the Cornish sculptor, Charles Moore, and was presented by Lloyd's of London to Cunard. Forward of the Britannia Restaurant is one of the ship's most popular bars, the Look-Out. It owes some of its popularity to the fact that it offers the passenger much the same view as the captain enjoys from the bridge. The bar has a microfilm reader which a passenger can switch on to read a chart of the area through which the ship is passing. Black leather stools and chairs, an olive green carpet, and bulkheads faced in Cedar of Lebanon lend it a nautical air and lead to ship-wise talk at the bar. Down now to the Quarter Deck, a first class deck when the ship is divided into two classes. Such is the extraordinary flexibility of QE2's design approach that she travels quite comfortably as a one-class ship when cruising. On the North Atlantic run she sails as a two-class ship, and the Quarter Deck contains some of her most magnificent rooms. Forward, on the port side, is the exclusive Grill Room, made so by a cover charge for its 100 seats. Panels of Bordeaux red leather and velvet cover the bulkheads. Life-size statues of the four elements—Fire, Earth, Air and Water—look down on the diners. They were created by the French sculptress, Janine Janet, entirely of things of the sea—mother-of-pearl, mica, coral and shells. The Grill Room's air of exclusiveness and discretion is emphasised by the fact that it can only be entered, by way of a spiral staircase, from its own small bar on the deck below. 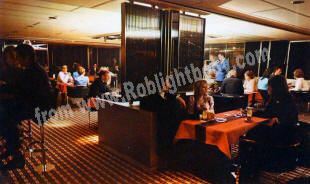 Aft of the Grill Room lies the sumptuous Columbia Restaurant, seating 500 and, like the Britannia, running the full width of the ship, Bronze tinted glass screens divide the room into smaller areas. 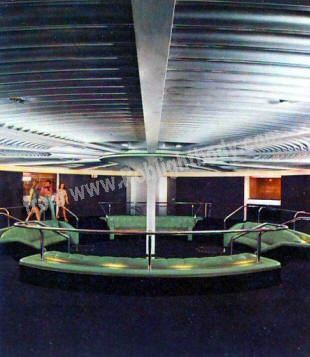 Wall panels are of ochre leather, and the ceiling is covered with the soft silver aluminium which is one of the unifying features of the ship's design. Much of the restaurant's lighting is hidden in the ceiling, and the manager can vary its brightness and colour from a console beneath his desk—a feature repeated in most of the public rooms. Lights are sunk into the centre of each table and shine up through a sculpted tower of Perspex which reflects and refracts the light until it has something of the quality of candlelight. The shops on Boat Deck, designed by Stefan Buzas and Alan Irvine, have something for everyone—duty free. The de luxe One Deck Shop offers a wide range of high class goods. 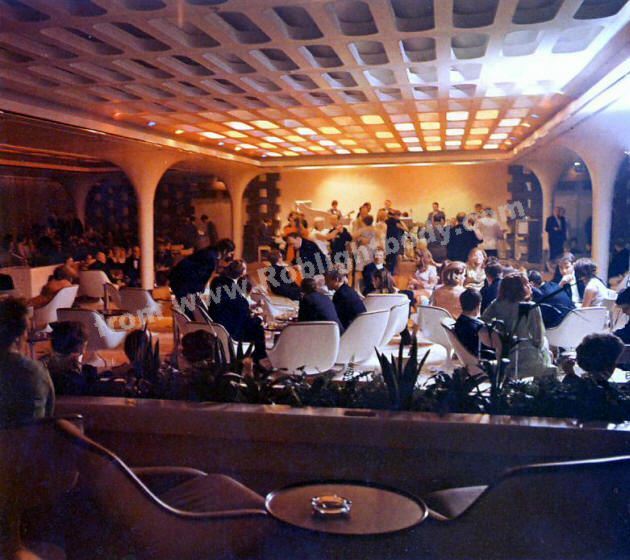 The Q4 Room (above) by David Hicks is the de luxe night club which doubles by day as the lounge bar for the Quarter Deck Lido. is in muted shades of green—sofas in rich green leather and mohair velvet, onion-shaped brass lamps shining onto rosewood drinks tables. In here there is a discreet popping of champagne corks. The staff are veteran stewards who sailed in both the earlier Queens. 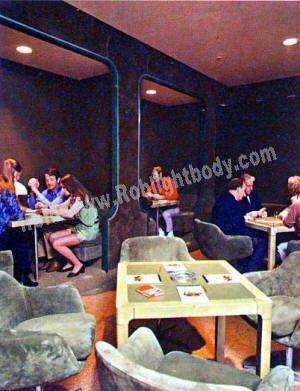 In the Card Room, across the deck from the Midships Bar, spotlights in the ceiling illuminate the players' hands and cards. Wall panels and chairs in green suede complement the green baize tops of the rosewood tables, and a deep green and beige speckled carpet rounds off this one-purpose room. Next door, in the Quarter Deck Library, brass and leather has been used to create a nautical effect. Writing chairs are in brass and black leather. Brass bound ships' chests serve as side tables to deep Chesterfields and evoke the smoking room atmosphere of ships long gone. The Queen's Room, designed by Michael Inch-bald, dominates the Quarter Deck. 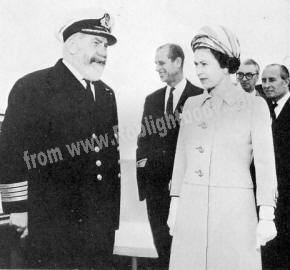 It drew an exclamation of delight from QE2's royal namesake when Her Majesty visited the ship on the eve of her maiden voyage to New York. A feature of the room is the superb bust of The Queen by Oscar Nemon. Here again the full width of the ship has been used, and the light pouring in through deep windows illumines the airy whiteness which is the main effect. A white, trellised ceiling, chairs upholstered in natural hide, structural columns encased in inverted trumpets of white fibreglass are set off by flame tweed upholstery and scatter cushions in orange, honey and lemon. The Queen's Room, for most of the day, is quiet and restful. It comes alive, gently, for afternoon tea, and more noisily at night, for one of the after-dinner floor shows. 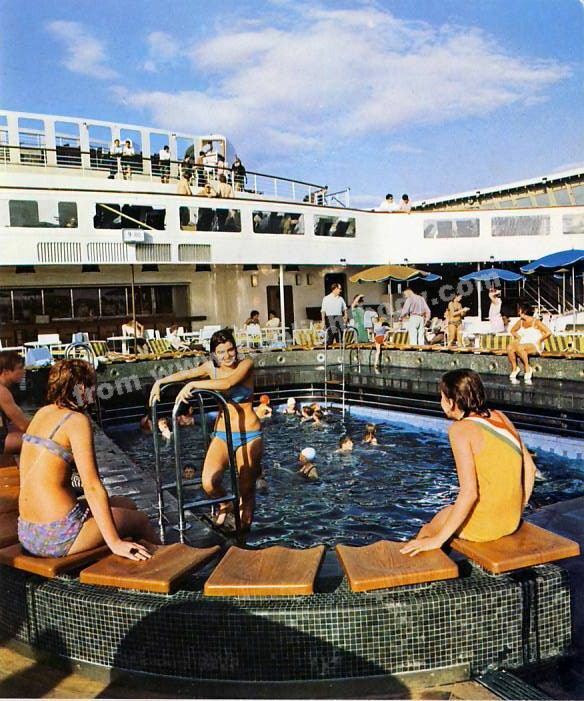 When this is over passengers can move to the Q4 Room, which serves as the Quarter Deck swimming pool bar by day and a night club far into the morning. 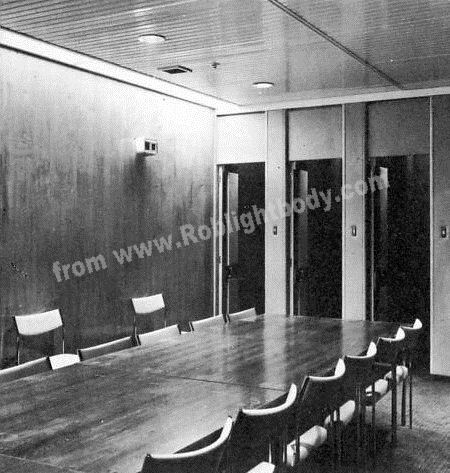 Designed by David Hicks, it is a coolly professional room with black tweed banquettes, black leather table tops, and wall panels of grey flannel. As it has to serve bathers by day and dancers by night, it makes a chameleon change of character with a clever switching of accessories. The plates of bacon and eggs start coming up at 2 a.m.
Accommodation starts on One Deck. Here and on Two Deck are the 46 luxury suite rooms out of QE2's total of 291 de luxe rooms. There are innumerable permutations of colours, materials and room arrangements. The luxury suites have dressing rooms (each with a refrigerator) showers as well as baths, walls of natural Thai cotton and upholstery of wool or leather. Some have chocolate carpets with upholstery in tangerine, yellow and shocking pink. Some have beige carpets, caramel curtains, and check upholstery in aquamarine and cyclamen. Furniture is low, with a light oak veneer. In QE2's standard accommodation there are 687 rooms, and the new design approach which invests the ship with so much excellence has not stopped short in these more modestly priced rooms. Their bulkheads are lined with specially designed Formica rather than wood veneers, and the beaten gold leaf which is used on some luxury suite bedheads is absent. But each has a bath or shower cabinet and lavatory, is air conditioned and has a telephone. Colour schemes and materials are of uniformly high quality which will set new standards in "tourist" accommodation for many years to come. Good design is equally evident in accommodation for the ship's 920-strong crew. Officers and petty officers have individual rooms in five different colour schemes. Ratings' cabins are very comfortable; all have shaving points, drip-dry rails, and even boards for pin-ups. The Midships Bar - sophisticated and intimate - is on the Quarter Deck near the Columbia Restaurant. Designer was Dennis Lennon. The Conference Room for business meetings has five telephone booths. The vast open-plan stainless steel kitchens have one central cooking area. The Beauty Salon by Steiner of London provides a comprehensive hairdressing and beauty service. 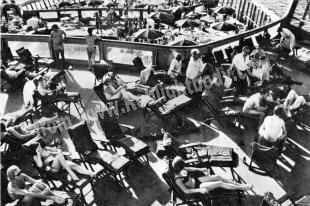 close the open air pools on the Quarter Deck and One Deck, there are two other indoor pools on Six Deck and Seven Deck, the first with a Turkish bath alongside, the latter with a sauna-the first ever sauna bath in a ship-and a gymnasium.Below the public decks, the ship offers the facilities of a small resort. 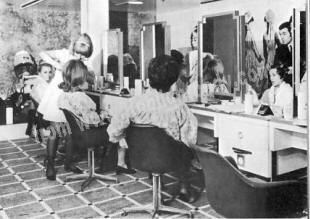 There are two banks, a barbers shop and a beauty and hairdressing salon with 13 stylists. There is a synagogue, and many shops, one selling jewellery in the £3,000 price bracket. To explore the lower decks is to appreciate how Cunard came to use 25 miles of wool carpet in QE2 and why 64 carpet cleaners and 115 vacuum cleaners are needed to deal with it. 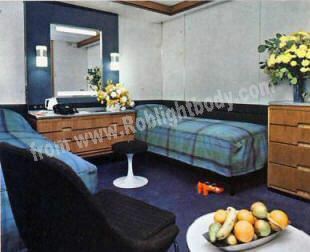 Dennis Lennon, the industrial designer, coordinated the work of all other designers of the ship's interior. 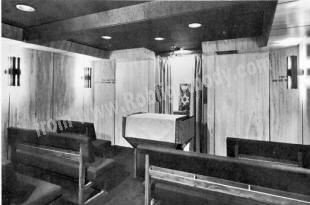 It was Lennon's task, in addition to designing many of the public rooms and suite rooms, to introduce by his staircases, main entrances, corridors and circulating areas, a design "signature" apparent throughout the ship. Contrasts and delights abound. 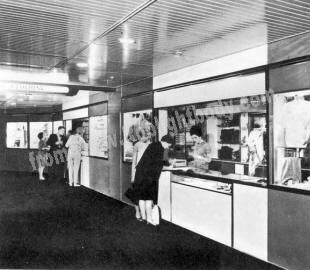 Paintings and prints of great value are scattered about QE2's corridors and staircases, yet just as much care has been lavished on free token-operated launderettes and ironing rooms for the convenience of passengers with small children. The kennels on the Signal Deck house 16 pets. On the maiden voyage to New York one passenger was a pet mouse whose fare, incidentally, was £1. 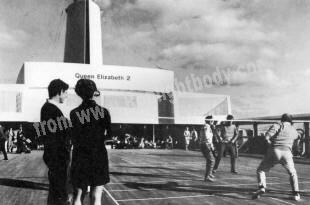 QE2's hospital is the largest and most modern afloat. It has six wards, an X-ray room, an operating theatre and dental surgery, and a laboratory where pathological tests can be carried out. The ship's newspaper, The Daily Telegraph, is the first to be printed entirely at sea. 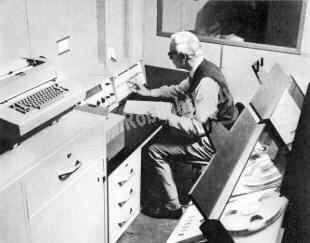 Its contents are transmitted from the parent paper in London to QE2, where type is automatically composed electronically, radio controlled from London. Special reports from Wall Street, American domestic and sporting news are contributed daily by The Daily Telegraph's New York office. Cunard's move from the transport business into the leisure industry has led to the concentration of the purser's, catering and entertainment departments into a single hotel department. The term "purser" has gone, and with it the familiar zig-zag braid on the sleeves of catering officers. At the head of the hotel department is a seagoing hotel manager, directly responsible to the captain. His department is by far the biggest in the ship-760 men and women out of a total complement of over 920. Two are in a category never before employed on board ship. They are two girls whose job is data preparation for the ship's computer. Though the computer is mainly concerned with the liner's machinery, it maintains stock records ranging from pillow slips-which number 26,200-to cocktail stirrers. A great ship's statistics are always staggering, and QE2's are no exception. She carries 64,000 items of crockery, 51,000 glasses, 23,000 sheets, 2,000 oven cloths, 3,000 aprons, 5,864 tablecloths, and 3,300 bath mats. On a normal transatlantic round trip her shopping list includes biscuits 2,000 lbs ; flour, 3,000 lbs ; cereals, 800 lbs ; rice, 3,000 lbs; herbs and spices, 50 lbs. Jam and marmalade, 96,000 jars ; juices, 3,000 gallons ; tea bags, 50,000 ; tea (loose) 500 lbs ; coffee, 2,000 lbs ; sugar, 5,000 lbs ; baby food, 600 jars; dog biscuits, 50 lbs; caviar, 150 lbs ; foie gras, 100 lbs ; butter, 3,500 lbs ; bacon, 2,500 lbs ; ham, 1,200 lbs ; cheeses, 3,000 lbs ; eggs, 79,200 ; cream, 3,000 quarts ; milk, 2,500 gallons ; fish, 1,400 lbs ; lobsters, 1,500 lbs ; crabs, 800 lbs. Fresh fruit, 22,000 lbs ; frozen fruit, 2,500 lbs ; ice cream, 5,000 lbs ; kosher food, 600 lbs ; beef, 25,000 lbs ; lamb, 6,500 lbs ; pork, 4,000 lbs ; veal, 3,000 lbs ; sausages, 2,000 lbs. Chicken, 5,000 lbs ; ducks, 3,000 lbs ; turkey, 5,000 lbs fresh vegetables, 27,000 lbs ; potatoes, 300 cwt pickles, sauces etc., 2,000 bottles. Fresh fruits and vegetables, and regional delicacies are purchased en route: cucumbers and tomatoes at Las Palmas, fresh strawberries in Teneriffe, exotic fruit from ports of call in the Caribbean. The modern print shop produces all the ship's programmes and menus daily as well as a special edition of the 'Daily Telegraph'. 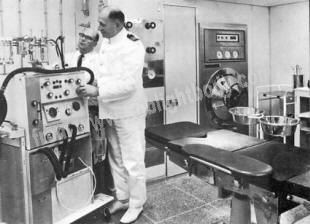 The operating theatre is part of a comprehensive ship's hospital which can meet any emergency. The gay and lively Theatre Bar is an intimate night spot as well as a popular pre-Theatre meeting place. Designed by Jon Bannenberg, the green Card room is a cool and tranquil setting for concentration. Bannenberg was also responsible for the refreshing Six Deck swimming pool. The bright red columns are changing cubicles. 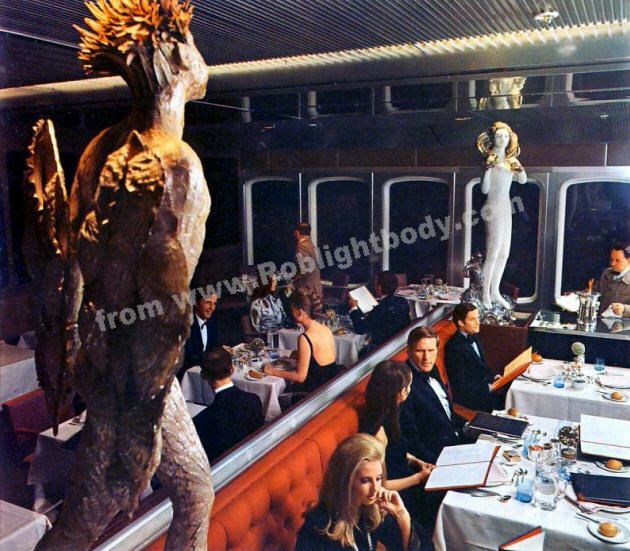 Most exclusive restaurant in the world, the 100-seat Grill Room designed by Dennis Lennon is discreetly accessible only through its own bar on the deck below. Design of the Lido deck ensures that passengers are sheltered from the wind whatever its direction. The tiny synagogue was designed by Professor Misha Black. bottled Chambertin. The liner carries 4,000 cigars (18 brands), 25,000 packets of 20 cigarettes (53 brands, including one Russian), and 100 lbs. of pipe tobacco. Quite apart from bottled and keg beer aboard (12,000 bottles and 6,000 gallons of keg), the bulk beer store in the bows is a refrigerated room from whence tanks with a capacity of 13,500 gallons pipe beer direct to passenger and crew bars. 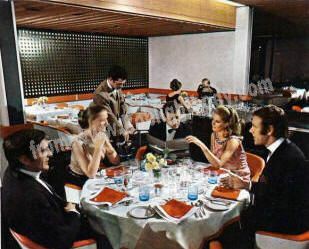 The single enormous 17,000 square feet kitchen, almost totally made of stainless steel, was designed after studies of the most up-to-date kitchens in the leading hotels of Britain, Canada and the U.S.A. Escalators connect it with the Britannia Restaurant, on the deck above. 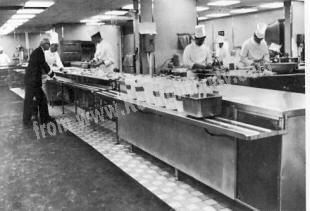 The tremendous array of equipment includes a souffle oven, in which 200 individual souffles can be prepared, and ultra-violet bactericidal fittings in its storerooms. The kitchen is served by twenty-one refrigerated storerooms, all built to satisfy United States Public Health construction requirements, which are the most stringent in the world. The executive chef, Arthur Townshend, joined Cunard as an apprentice cook in 1937. He has served with Cunard ever since, leaving only to gain more experience in leading hotels in Britain and France. 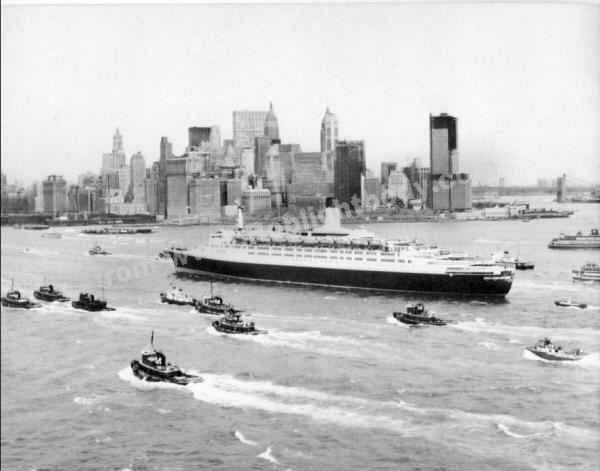 A thousand factors dictated QE2's design long before the day her first section of keel was laid on July 4, 1965—American Independence Day, and the 125th anniversary of the maiden voyage of Britannia, first of the Cunarders. None was given higher priority than safety. The ship is practically clad in asbestos—over 2,000,000 square feet of it. Corridors with walls of what appear to be beautifully grained solid wood, are made of veneer 1/32nd of an inch thick on asbestos board. 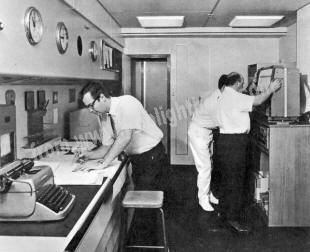 In the heart of the ship, the safety control room keeps a 24-hour watch on every department, and is in immediate touch with the bridge and engine control rooms. Automatic sprinkler and alarm systems, if triggered by fire, warn the control rooms. In the centre of the room is an illuminated master plan of the ship. A turn of a handle presents a plan of the affected area and the fire fighting equipment to hand. Fires in holds and on car decks can be fought remotely in the first instance. The safety control room can release inert gas into the affected area to smother the fire. QE2 carries lifeboats and inflatable rafts for 1,000 more people than her full complement of passengers and crew. All the lifejackets have a specially designed collar which will keep even an unconscious man's mouth six inches above water. 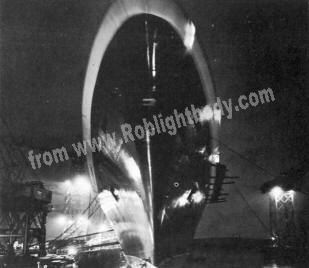 Of the many unique design features, none has caused more comment than QE2's funnel. The traditional fat, red Cunard funnel with its black top was a familiar and friendly sight to everyone but the sunbathing passenger on whom it deposited oil smuts. Research dictated the new unconventional design at the expense of tradition because it was proved that only a tall, slender funnel would keep decks clear of soot deposits. Twenty models were tested in wind tunnels, and all were scrapped except the final version with its shovel-shaped scoop which was designed to direct a stream of air at the emerging fumes and push them well clear of open decks no matter from which quarter the wind was blowing. Research also dictated her bulbous underwater bow, as functional as the blunt head of a whale. It creates the sort of turbulence through which the ship slips most easily. A bow wave is beautiful, but it stems from resistance, and resistance costs fuel. Much of QE2's viability depends on her economical fuel consumption. She has only three boilers, against 12 on the Queen Elizabeth and 27 on the Queen Mary. She has only two propellors against their four. She has the most powerful main turbines ever built for a passenger liner yet her fuel consumption—about 520 tons a day—is half that of the earlier Queens. Fuel and machinery space saved contributed to the spaciousness of the passenger accommodation which is one of the most striking features of the ship. The hull is welded, and plates are welded edge to edge. This technique obviated the overlap of plates necessary for riveting and saved 6,000 tons of steel plate and 2,000 tons of rivets. This saving in weight enabled the ship to be built up until a slender hull appeared to be carrying a towering mass of public rooms. She is perhaps not so dignified as the Queen Mary nor does she have "sheer", the graceful sweep of deckline which characterised ships like the Mauretania. The QE2 is contained by straight lines, like a modern modular building, and her aluminium superstructure is high in relation to her length. James Gardner, the design co-ordinator appointed to care for exterior aesthetics, reduced the impression of height by having a "shadow tone" painted on the deckhouse face behind the ship's lifeboats. And he cleared up the usual clutter of vents and cowls by bringing all vents up at one point mid-ships on the Signal Deck, giving the ship an unbroken line from the bridge to well aft. The ship Her Majesty Queen Elizabeth II launched on September 20, 1967, is as different from the earlier Queens as a ship could be. 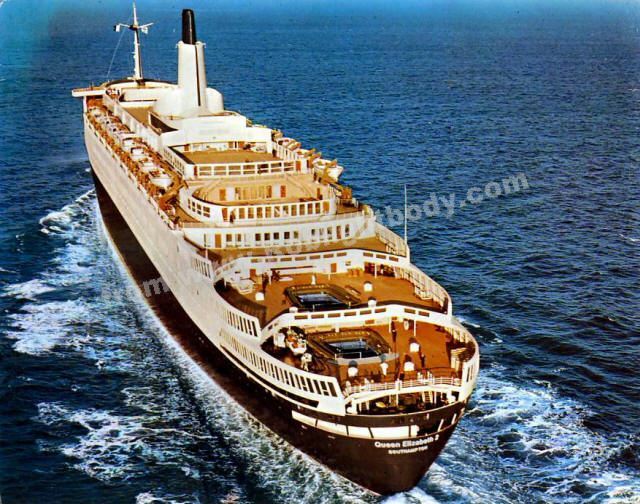 Veteran passengers of those wonderful liners which inspired deep affection and loyalties will no doubt argue nostalgically for years over the respective merits of the old and the new. 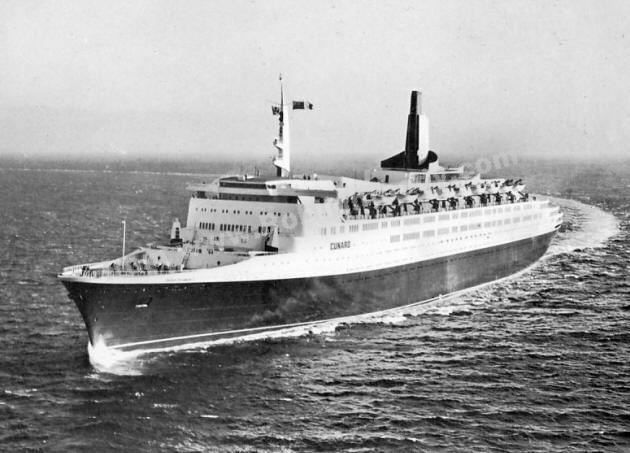 Cunard chiefs may share some of their nostalgia. But they have none of their doubts. The vision they had for QE2 is great, global, and far removed from the roles for which the Queen Mary and Queen Elizabeth were cast. These ships, following in the wake of the Berengaria, the Aquitania, the Mauretania, were conceived for transportation across the Atlantic in the fastest time and most luxurious manner. Cunard saw condensation trails in the North Atlantic skies before they were a reality and switched their thinking to the leisure industry. QE2 was born in the age of the jumbo jet. 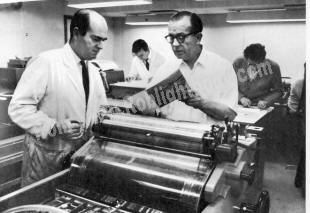 She was never in competition with it from the moment her hull was first committed to paper. That is why QE2 is a floating resort hotel. Some would say a floating resort, so spacious is she, and so varied her entertainment. Her marketing plans are to cream off the best of the North Atlantic trade in summer time, and in winter to switch more easily than any other ship is capable of doing to cruising. Most of her business is expected to come from North America as she plies between New York and the Caribbean. But there are more adventurous plans for her future. One is to make leisurely crossings of the Atlantic, taking in ports in the West Indies and the Canaries en route. As busy men might not be able to spare all that time, Cunard have arrangements with airlines to pick up or deliver passengers at appropriate airports. They will not need to sign on for a lengthy cruise. They will join the ship where and when they can and leave it when they must. Flexibility will be the keynote. This great and gracious ship will be most at home in the Caribbean. But she will also look for the sun in the South Atlantic, between Rio and Cape Town. The Panama Canal is open to her, and she may cruise the western seaboard of North America and deep into the Pacific. The birth of QE2 was not free of troubles, but they were soon resolved. Much is now expected of her. Much hope and pride sails with her. She is the culmination, perhaps even the last, of a long evolutionary line. She is a ship of her time who is yet expected to be ahead of her time and to grow old gracefully in the 25 years or so of her working life. 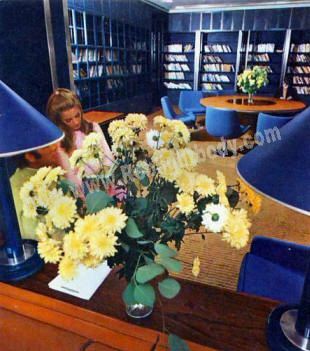 Dennis Lennon has achieved a cool, quiet atmosphere in his Upper Deck library. 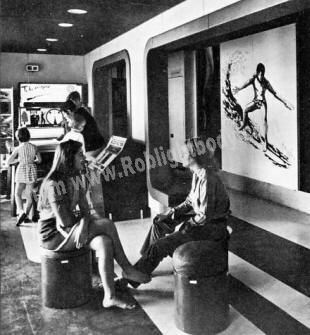 The main entrance of the ship, the Midships Lobby, was also designed by Lennon. Queen Elizabeth 2 was designed by a team of six Cunard naval architects headed by Mr. Dan Wallace, the Company's chief naval architect. This team was responsible for the whole of the design and layout of the ship except for the machinery spaces and decorative effects. Another Cunard team of seven engineers led by Mr. Tom Kameen, director of engineering, coordinated the design of the main turbines, auxiliary power plant and all other machinery. James Gardner and Dennis Lennon were joint design co-ordinators for QE2. Mr. Gardner's main responsibility was the exterior styling and trim of the ship. Mr. Lennon's task was to lead and co-ordinate the work of a group of interior designers and to achieve a common design signature. QE2 was built by the Clydebank division of Upper Clyde Shipbuilders Ltd., a consortium of the five major shipyards on the upper reaches of the Clyde. The order was originally placed with John Brown & Co. (Clydebank) Ltd., which became the Clydebank division of U.C.S. when the five yards were merged in February 1968. John Brown built both the Queen Mary and Queen Elizabeth and a long line of other Cunard ships. The main turbine machinery and gearing was designed by Pametrada and built by John Brown Engineering (Clydebank) Ltd. The three boilers of Foster Wheeler ESD I1 design were also built by John Brown Engineering. More than 300 British firms contributed to the building and furnishing of the QE2. All were selected with the greatest care and had to meet the exacting specifications demanded by Cunard. It is not possible to list the names and products of all the concerns employed in the creation of this wonderful ship but they ranged from industrial giants like A.E.I. who built the main transformers and pneumatic control equipment, to local enterprises such as the Southampton and District Spastics Association who provided coat hangers for the crew. Back Cover : QE2 on Trials. Note the huge area of open sheltered deck.